What can identifying your own metabolic type give you? Metabolic IQ is an innate identification of the natural processes taking place in the body that allows optimizing the proportions of macronutrients, such as proteins, fats and carbohydrates, in line with the body’s needs. We all need these ingredients to function, regenerate our bodies, be able to run metabolism, but each of us needs them in different ratios. This is the whole secret behind health and maintaining a constant weight and a dream figure without having to torment oneself with yet another miracle diet. Undoubtedly, most of you know your blood type, but you probably don’t know your metabolic type, do you? Still few people understand that simple things are the best. That is why it’s best to replace constant dieting, counting calories and struggling to lose weight, with eating smart. 3. Love yourself, love your body, enjoy life and stop struggling to slim down once and for all. You are what you eat, what you drink, what you breathe, what you think, and what lives in you. Remember that you get your birth certificate as a birthday gift, but work on your biological age all your life. The first step towards implementing the MIQ protocol is to solve the test consisting of 48 questions – most of them have 3 answers to chose from, and some let you choose only one answer. Questions may seem biased, or may seem to not apply to you, but this is only a guise. Based on my 12-year practice at testing with a group of at least a dozen people, I can say that the test is effective. The key to implementing the MIQ protocol and improving your or your clients’ quality of life is to understand that there is no bad or good type. Instead of focusing on actual answers, people who solve the test often wonder if they get a good result, whether they belong to a good or bad group. Meanwhile, nature rules at MIQ. About 60,000 years ago, we as humanity began to migrate and spread to other continents. At that time our DNA began to adapt to the requirements of the environments we settled in. So there can be nothing inherently good or bad about your body’s metabolic IQ – it is merely an answer and an attempt at the best possible adaptation to the environment of a given human being. INHERENT FACTORS – metabolic type, DNA, blood type. ENVIRONMENTAL FACTORS – biology of beliefs/total biology (emotions), microbiome. Once you know your metabolic type – if you have answered the questions truthfully – you will get rid of many ailments associated with life nowadays. You will eliminate your age-old problems with the digestive tract, flu, colds, migraines, lack of energy. By implementing a nutrition model that takes into account your metabolic type and lifestyle, you are able to reach the peak of your biological capabilities, which translates into quality of your life, your appearance and even your relationships with others. How can you make sure everything is going in the right direction? First and foremost, by observing your body you can determine if you feel better, look better, have more energy – in general, if something has changed in your life for the better. By exchanging experiences with others who have solved the test, identified their MIQ and put it into practice, you are able to still improve your dietary choices. The worst you can do is solve the test based on your relationship with a partner – this is often a cardinal error. If couples of extremely different types solve the test together based on their home practices, they will never receive results reflecting the actual needs of their bodies. What can you do with the Metabolic IQ mobile app? 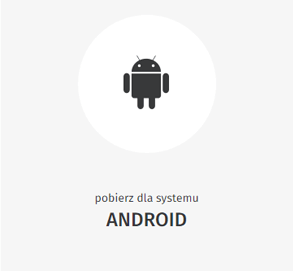 The app is currently free, available in 7 languages for both Android and IOS. The application allows you to solve a metabolic test, the same as the one on the website. Having received the result in the basic version, you have access to the characteristics of your metabolic type, a breakdown of products most suitable for you into proteins, fats and carbohydrates. Moreover, you will find there a list of supplements tailored to your MIQ, as well as dietary advice. In the paid version, you have access to a water meter, which you can turn on to send you notifications to remind about the appropriate daily water intake, a diet timer that sends you tips suitable for your metabolic type, knowing what such a person usually forgets. In addition, the pro version gives you a counter of protein absorbed from a product and a protein meter for a given MIQ, because everyone needs different amounts of this macronutrient. Both versions of the app contain food pyramids, drinks, spices and additives, and a description of the functioning of the autonomic nervous system. Thus, it depends on the user how much they delve into the functions of the application and whether its exploration will translate into a real change in one’s eating habits. 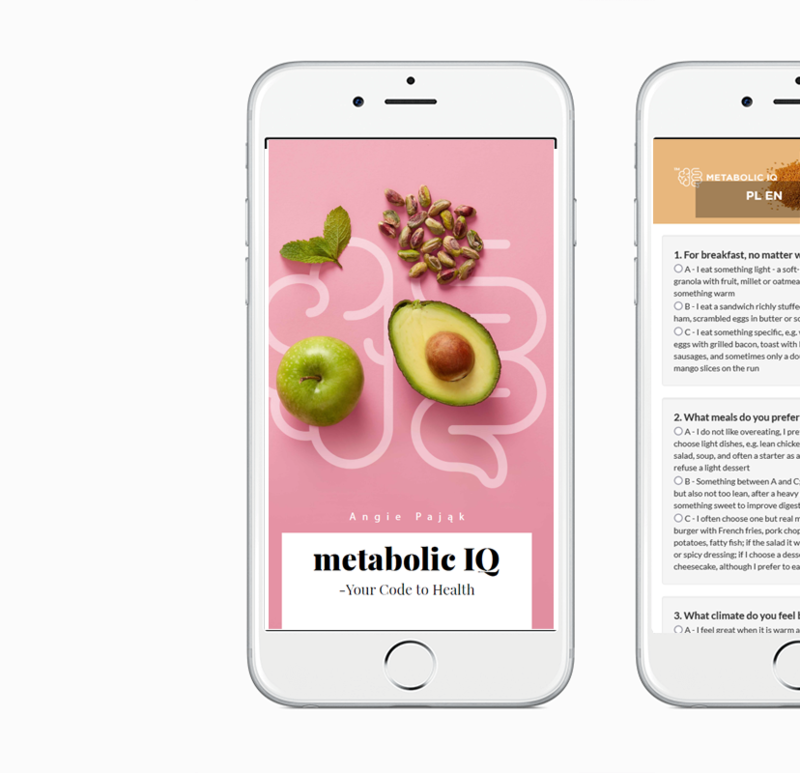 Another element to be used is the book Metabolic IQ – Your code to health, available both in paperback and digital version. In the book, you will read about where the metabolic types came from, why you should know your MIQ, you can also solve the metabolic test or carry out a weekend test if you have a problem answering questions. You will also find out why wild cats are not vegetarians, that there is no such thing as an ideal diet for everyone, and who is really destroying our planet. The book is a compendium of comprehensive knowledge about metabolic IQ, but also of a healthy lifestyle independent of metabolic types. The second useful book is your health journal. The journal includes all the information that we think may be important and useful for the user, and they decide what they want to do with that. You can write your health journal by yourself, since the user themselves decide whether it will accompany them for a year, two years or maybe longer. Inside, there are tips that are in line with metabolic IQ, gluten IQ and shopping IQ, which help you function on a daily basis. As you know, the more, the merrier. That is why we have created the MIQ Community, thanks to which people who already know their type can exchange experiences with those who have already implemented the protocol in their lives. We are currently working on a function in the application that will allow searching for a particular type in the immediate area, so that you can talk to your metabolic colleagues and exchange insights on your metabolic IQ. Once you understand what it is, MIQ will be fun for all. Guessing and recognizing metabolic types is a real treat. By exchanging experiences with others who have solved the test, identified their MIQ and put it into practice, you are able to still improve your dietary choices. • Recognizing the customer’s actual needs. • Adapting therapy to the customer’s needs in accordance with their MIQ. • Stabilized functioning of the digestive tract, which improves the appearance of the skin. • Passive income for the office. • Innovative approach to the offer in line with global trends. • Reaching the best possible therapy results in combination with the natural potential of one’s body. An additional option is DIET TIMER that reminds you of mealtimes. You decide about the specified hours, frequency of communications and days on which you want to receive notifications. To motivate you to effectively use your MIQ, in every additional information, you will get the new guideline tailored to your type of metabolism. If you get tired of receiving TIPS simply use the option to OFF.